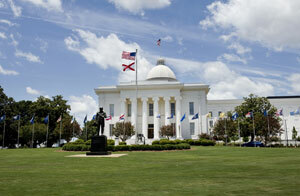 Montgomery is the capital of Alabama, is home to over 370,000 residents and is nicknamed “The Gump”. There are many effective advertising opportunities in Montgomery, including near the many universities within the city. For example, out-of-home advertisements near Alabama State University or Troy University would allow you to target your audience. Another attraction perfect for outdoor advertisements is Montgomery Zoo. The major highways that service the city also offer billboard opportunities. Billboards on U.S. 231 or U.S. 80 would generate high exposure of your business. Zip Codes: 36101, 36102, 36103, 36104, 36105, 36106, 36107, 36108, 36109, 36110, 36111, 36112, 36113, 36114, 36115, 36116, 36117, 36118, 36119, 36120, 36121, 36123, 36124, 36125, 36130, 36131, 36132, 36133, 36134, 36135, 36140, 36141, 36142, 36177, 36191.